Once again, Gyil player Bex Burch brings her unique energetic and intense vibe to Sheffield, this time with a return to Yellow Arch Studios, and a brilliant line up that features Ruth Goller (Acoustic Ladyland, Melt Yourself Down, Andreya Triana, Rokia Traore, Bojan Z) on electric bass, and Jim Hart (Marius Neset, Julien Lourau, Ivo Neame, Ralph Alessi, Wynton Marsalis and the Lincoln Center Jazz Orchestra) on drums. Vula Viel means Good is Good in Dagaare, the language of the tribe in Upper West Ghana where Bex lived, farmed and studied for three years. Vula Viel’s music is intensely rhythmic; a uniquely engaging mix of African, punk and minimalist influences, based around the Gyil (the Dagaare xylophone made of sacred lliga wood), seemingly imbued with the music of Steve Reich, Bill Laswell and Arthur Russell, as well as jazz. They’re touring with a new album ‘Do Not Be Afraid’ released in January, bringing with it an increasingly rough, post-punk edge in the music. Captain Avery & the Cosmic Triceratops of Intergalactic Peace are probably the wildest & most celestial group of musical miscreants Sheffield has ever spawned. Their live show is immersive and full of zany sequinned energy: expect a lambent cocktail of Cosmic Afrobeat, Psychedelic Balkan, Space Shanties, Intergalactic Funk and Mutant Disco. Expect Wild Dancing & Joyous Abandon! Beyond Albedo are a cerebral & improvisatory retro-futuristic synth-jazz 4 piece. 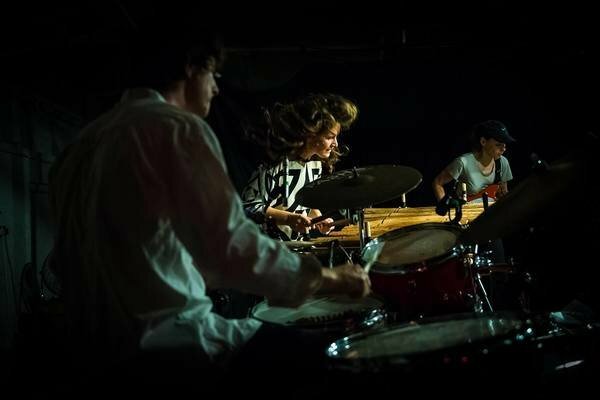 This jazz/EDM quartet make original music that's exploratory and experimental, but also energetic and danceable feeling equally at home in clubs, concert halls, art galleries and pubs. All members bring both traditional and genre pushing elements to the bands exciting sonic mix resulting in a sound that draws from the jazz tradition while pushing it in exciting new directions. This brand new group are helping signpost a way for how jazz can fuse in elements of electronic dance music to its ever evolving tradition and you can catch them here at one of their first ever gigs.